Turns out there is a museum for everything. I decided to blog about carrots and wanted a snippet of history so, of course, I googled “carrot history” and discovered the Carrot Museum. Now I’m wildly overeducated and can tell you, with some authority, that the modern carrot originated in Afghanistan 5,000 years ago and then migrated to Europe, where the enterprising Dutch cultivated it into the delicious root vegetable you know today. We planted two varieties this year. 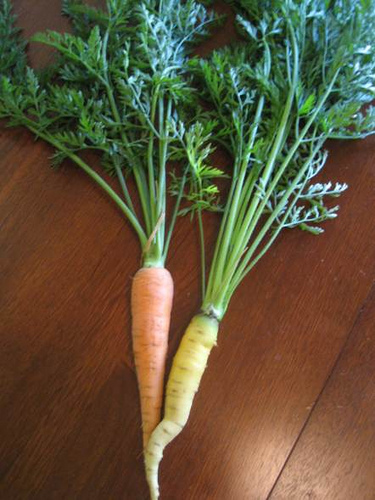 The Rainbow Hybrid promised carrots in hues of white, orange and coral. It yielded few carrots, however, so that experiment is over. The Sweetness Three hybrid was sweet indeed – bountiful, 6-8 inches long, and tasty. In several plantings, we used all 500 (!) seeds. No, we don’t have 500 carrots. I think the yield is probably a little better than 1 in 5. Since we have a long growing season here, we bought more seed. Burpee’s Scarlet Nantes promises “slim, sweet, 6-7” almost coreless orange roots.” They’re just poking out of the soil, so we need 60 more days of sunshine til harvest. Our son, Sam, largely oblivious to the garden except for what arrives on the dinner table, read that the carrots will keep well in the ground and become even sweeter when the weather turns cold. We shall see. My favorite carrot recipe is a blend of root vegetables – beets, sweet potatoes, parsnips and carrots – roasted at 350 degrees in a little olive oil, salt and pepper. My friend Laurie makes a killer mixture of olive oil and minced garlic for her roasted veg – give it a try. Last night for a dinner party, I left the carrots full length, peeled them, drizzled on a little olive oil, dried thyme, salt and pepper – and slow-roasted them at 325 degrees. Turn them every 20-30 minutes. Because of the size, the carrots took more than an hour…but it was worth it. The slow roasting brought out the natural sugars in the carrots. Delicious. Make sure you check out the Carrot Museum. Its trivia page produced this factoid: The world’s longest carrot was 5.839 metres (19 feet 1 7/8 inches)! How do you pull a 19 foot carrot? with a machine? Don’t ever plant Danvers Half-Long…because that is what they are…..